As a result of sub-prime health, today’s despatch will be random and visually-driven, with the odd raid of the Mobile Media Control Console (i.e. iPhone)’s archives. 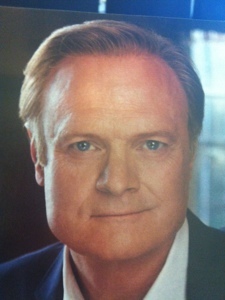 This, apparently, is a man called Lawrence O’Donnell who hosts a program on MSNBC in the US. An anchor from central casting if ever there was one. Can you believe his manly square jaw? You could go fracking with that bone structure. Do you think he’s stored nuts in his cheeks for winter? 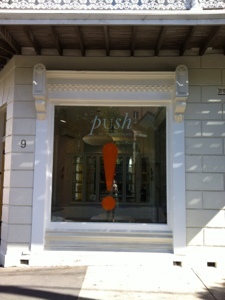 A while ago I wandered past the new Pushmatahaa shop in Paddo. 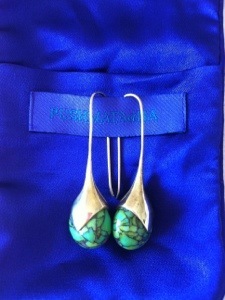 They make gorgeous earrings. 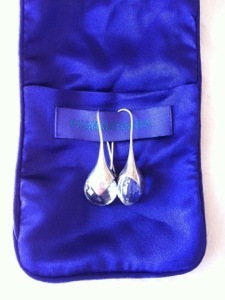 Last year, before the era of frugality set in, I bought myself not one but TWO pairs. They lay beneath the marital bed of deceit for the requisite cooling-off period before being unveiled. 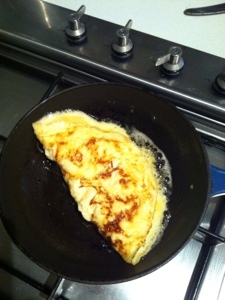 Believe me, unless I want my children growing up in a broken home, it’s best that way. When I wondered into their store recently, though, there seemed to be a lot of skulls. Skulls on rings, skulls on earrings, skulls on skulls. Look, I love Alexander McQueen’s work as much as the next duchess, but what the hell is it with skulls? I just can’t force Laself to see the appeal. This ad caught my eye last week — it’s for an alternative financial services institution (which we should all support — say no the Big Four and their stranglehold on Wide Brown Land retail banking!). But not for obvious reasons. This man says things like, “I’m on your holiday”, “I’m in your plunge pool”, “I’m getting your spa treatment” etc. 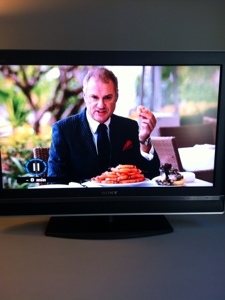 He also says, “I’m eating your crustaceans” as he glares at you over a massive platter of juicy pink prawns. No sirree bob, no-one would be eating my crustaceans. Sr Seriousimo often jokes there are probably thousands of Wanted for Genocide posters beneath the deep blue seas in areas heavily populated by prawns, plastered with the smiling face of La Triv. 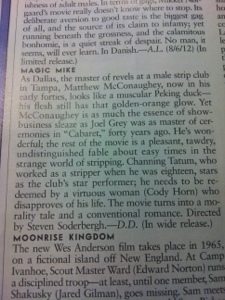 You probably can’t read this, and my photo edit thingo isn’t working, but it’s the New Yorker review of the fillum Magic Mike, and it says of Matthew McConaughey, “now in his early forties, [he] looks like a muscular Peking Duck”. I think they have a point. 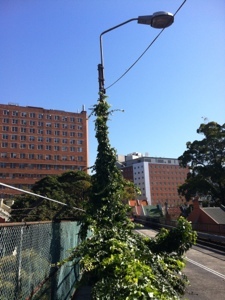 Now, what do you think…a twist on the urban public space vertical garden, or just ivy growing up a lamp post? Still not sure where I stand. Oh, that’s right, I barely can. I’m sick. 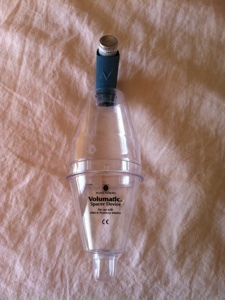 Back to bed *sniffs*.